If you have an active, intelligent dog, agility training can offer benefits for you and your pup. It’s a great source of exercise for you both, as well as a way to develop a strong bond between you through practicing a complex skill. If you would like to get starting doing agility training with your pup but don’t know where to start, here are five simple drills you can do at home. For puppies whose bones and joints are still developing, it’s crucial not to attempt any jumping or climbing that could strain your pup’s bones or cause injury. 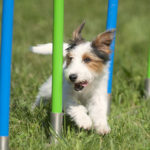 Never use standard agility equipment for puppies—it’s just too high. Instead, to get your pup started training as a puppy, use planks or bricks to create a low-lying dogwalk—no more than a few inches off the ground. This will get your pup used to the agility drill of walking on various surfaces and elevated dogwalks, but without risking injury. PVC piping can be used to create weave poles. Drive 10-15 into the ground in a line, and work with your dog on running back and forth through the poles. Start slow and stay close to your dog the first few times to get him or her used to running the weave pattern. Reward successful runs and offer lots of praise. Collapsible children’s play tunnels are widely available and make a good agility tool for use at home. Some dogs won’t be very comfortable with tunnels, so sprinkling treats through the tunnel or crawling through with your pup may be necessary to build confidence. In time, your pup should be able to run through quickly and go right on to the next drill. Hang an old bike or car tire from a strong tree branch to create a jump for your dog. Depending on your pup’s skill as a jumper, it may be a good idea to begin by hanging the tire fairly close to the ground. It can be moved up gradually as your dog’s skill and confidence increase. Build a teeter board using a long piece of wood (eight feet or so) and a large piece of PVC pipe. Buy a pipe with a six or eight inch diameter at least, and attach it to the middle of the board using carriage bolts to create a workable teeter board. Coat the top of the board with anti-skid paint to give your dog traction. Make sure to support your pup fully the first few times he or she walks the board, as it will likely be a surprising experience. If agility training means spending more time outdoors (as it probably will), make sure your pup is protected from unpleasant bites. TropiClean’s Natural Flea & Tick line includes shampoos and sprays to ensure your pet will stay pest-free. Our shampoo, AfterBath Treatment, and sprays kill Fleas & Ticks by contact to keep your pup comfortable and healthy. Get more information on TropiClean’s Natural Flea & Tick Products, and good luck with your training!